eBay India, spearheaded eCommerce in India when it started operations in the country in 2002. Today, it is the largest marketplace with 40,000 merchants and 30 Million products across 2,000 categories such as electronics, lifestyle, and media verticals. Mobile phone is one of its highest selling categories. Globally, eBay is among the top ten most-trafficked sites on the Internet and leads the online auction industry with more than 60 percent share of the market. To emulate its global success, eBay India partnered with Sokrati, an ad technology and analytics company and a Google preferred partner in India to increase relevant traffic and sales to its website. 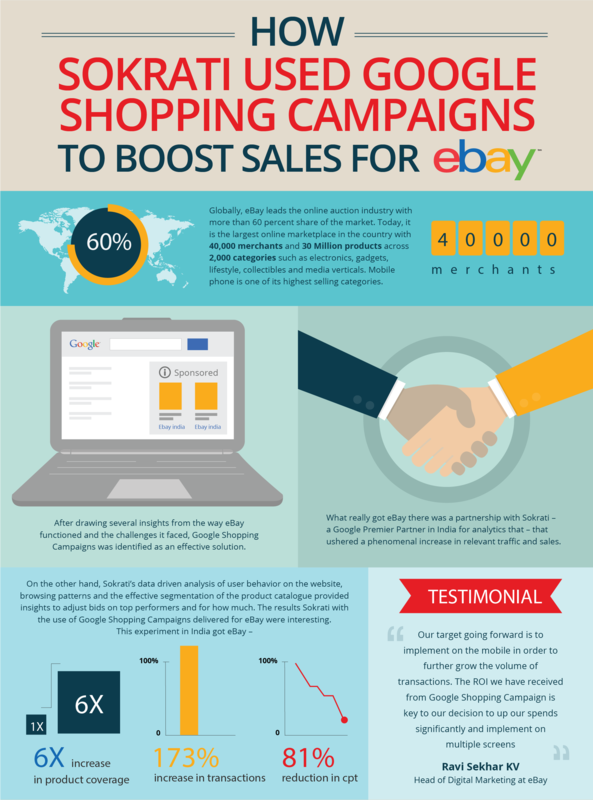 eBay India reached out to Sokrati in September 2013 to help meet their goals. As a first step, Sokrati turned to its data driven methodology for insights, and unearthed several interlinked challenges:-For starters, eBay’s large product catalogue was not optimally exposed/visible online. The display of images and text accompanying it was suboptimal, owing to the seller driven product catalogues. The higher selling products did not necessarily procure higher margins-Products going ‘out of stock’ were continuing to be advertised. Google Shopping Campaigns was identified as an effective solution to address the challenges. Sokrati’s platform in conjunction with Google Shopping Campaigns deliver an increase in traffic and sales. Google Shopping Campaigns allowed eBay India to optimize the product catalogue by organizing their inventory as it would in a store or catalog, grouping products of different types into a product group. “Google Shopping gave us the opportunity to promote our full product lines and gauge what online consumers are truly searching for, and which products capture their attention and interest,” confirms Ravi Sekhar KV, Head of Digital Marketing at eBay. A focus on the use of high quality product images and promotional text such as price, business name and other compelling data to highlight unique offerings & key selling points produced a significantly higher CTR (click-through rate) by delivering an excellent customer experience. “Google Shopping allows eBay to show our customers the products that they’re looking for, while increasing our rate of conversion. What looks good gets attention! The well-placed visual elements of the ads have made a significant impact on our business,” says Ravi Sekhar KV, Head of Digital Marketing at eBay. Supported by Sokrati’s data driven analysis of user behavior on the website, and its model based prediction engine, along with the effective segmentation of the product catalogues, provided insights to adjust bids on top product performers and for how much. Last but not the least, to address the critical challenge of ‘out of stock’ products, Sokrati’s algorithms dynamically detected those and automatically paused the corresponding keywords. eBay India has experienced an increase of 6X in product coverage. ‘Coins and notes’, a new category for example achieved 10,000 unique product SKUs being advertised, resulting in 1.1M impressions alone. A cumulative addressal of challenges has contributed to an increase of 173% in transactions with an 81% reduction in cost per transaction. Our target going forward is to implement on the mobile in order to further grow the volume of transactions. The ROI we have received from Google Shopping Campaign is key to our decision to up our spend significantly and implement on multiple screens.